Type species: G. lutea L.
Asterias Borkh., Arch. Bot. (Leipzig) 1(1): 25. 1796, nom. illeg. Lexipyretum Dulac, Fl. Hautes-Pyrénées 449. 1867, nom. illeg. Calathiana (Froel) Delarbre, Fl. Auvergne (Delarbre) ed. 2, 28. 1800. Chiophila Raf., Fl. Tellur. 3: 25. 1837. Type species: C. nivalis (L.) Raf. Ciminalis Adans., Fam. Pl. 2: 504. 1763. Type species: C. acaulis (L.) Borkh. Coelanthe Borkh. ex Griseb., Gen. Sp. Gent. 297. 1839, publ. 1838, nom. inval. Coilantha Borkh. in Roem., Arch. Bot. (Leipzig) 1 (1): 25. 1796. Cruciata Gilib., Fl. Lit. Inch. 1: 36. 1781, publ. 1782, nom. illeg. non Mill. (1754). Type species: C. verticillata Gilib. Dasystephana Adans., Fam. 2: 502, 548. 1763, as "Dasustephana". Type species: D. asclepiadea (L.) Borkh. Diploma Raf., Fl. Tellur. 3: 19. 1836, publ. 1837. Ericala S.F.Gray, Net. Arr. Brit. Pl. 2: 335. 1821. Ericoila Borkh., Archiv (Roemer) 1(1): 23. 1796. Type species: E. cruciata (L.) Borkh. Eudoxia G.Don, Gen. Hist. 4: 174, 202. 1837. Favargera Á.Löve & D.Löve, Bot. Not. 125: 256. 1972. Gentianodes Á.Löve & D.Löve, Bot. Not. 125: 256. 1972. Hippion F.W.Schmidt, Fl. Boem. 2: 18. 1794; Boem. 2: 18. 1794. Type species: H. aestivum F.W.Schmidt, nom. illeg. Holubia Á.Löve & D.Löve, Anales Inst. Bot. Cavanilles 32(2): 226. 1975, nom. illeg. non Oliver (1884). Holubogentia Á.Löve & D.Löve, Bot. Not. 131: 385. 1978. Mehraea Á.Löve & D.Löve, Recent Advances in Botany (P.Kachroo, ed. ), Prof. P. N. Mehra commemorative volume: 205–216. 1976. Qaisera Omer, Bot. Jahrb. 111.205. 1989. Pneumonanthe Gled., Syst. Pl. (Gleditsch) 238. 1764. Pneumonanthe Gilib. Fl. Lit. Inch. 1: 34. 1782, nom. illeg. non Gled. (1764). Type species: P. angustifolia Gilib. Ricolia Raf., Fl. Tellur. 3: 23. 1836, publ. 1837. Selatium D.Don ex G.Don, Gen. Hist. 4: 174, 196. 1837. Thyrophora Neck., Elem. Bot. (Necker) 2: 13. 1790, nom. inval., opera utiq. oppr. Tretorhiza Adans., Fam. 2: 503. 1763. Ulostoma D.Don ex G.Don, Gen. Hist. 4: 174, 196. 1837. Varasia Phil., Fl. Atac. 35. 1860. Type species: V. podocarpa Phil. Xolemia Raf., Fl. Tell. 3: 22. 1837 ('1836'). Type species: G. saponaria L.
Ho & Liu 2001. A worldwide monograph of Gentiana. Science Press, Beijing & New York. Linnaeus, C. 1753. Species Plantarum 1: 227. 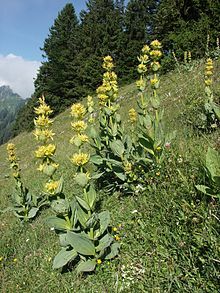 For more multimedia, look at Gentiana on Wikimedia Commons. Эта страница в последний раз была отредактирована 20 июля 2018 в 20:26.